The advantage of having a portable device is that you can carry them around just about anywhere. However, this portability is whitewashed every time you have to carry multiple chargers with you. So instead of making a campaign to call for electronics manufacturers to consider the idea of uniting for one charger, Innergie has come up with something more viable… at least for now! Elegantly engineered, the Innergie Magic USB cables have two types: the Duo and the Trio. 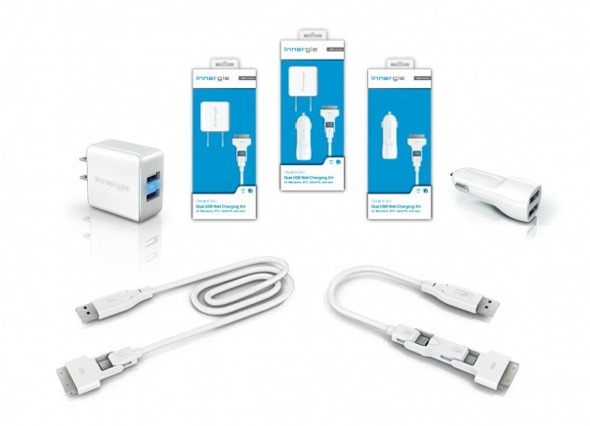 Both the Innergie Magic USB Cable Duo and the Innergie Magic Cable Trio USB will enable you to charge all your portable devices – including your iPad, iPod, iPhone, HTC, Blackberry, Sony Ericsson, Motorola, GPS and all thousands more devices that can be charged via USB – with a single USB connector! The Magic Cable measures 20 cm or 0.65 ft and weighs 15g or 0.5 ounces. It offers a convenient, integrated multi-tip, two-in-one design for the Innergie Magic Cable Duo, and three-in-one for the Innergie Magic Cable Trio so that you can charge your devices speedily and then sync them with your laptop or PC so you can also transfer your files while charging the devices. The Innergie Magic USB Cable Trio has a mini USB that is compatible with HTC, GPS units, MP3 players, digital cameras and other devices, and a micro USB is compatible with Blackberry, Bluetooth headsets, eBooks and more. Finally, it has a charger that is compatible with your Apple products. Wouldn’t it be great to flaunt all your devices as they are connected to one multi-functional charger? The Magic Cables are also part of Innergie’s new charging kits that will allow any consumer to charge his or her devices at home, in the office, in the car and while on the plane! However, the package will still require you to carry those adapters with a USB cable and port that must be plugged in. I think this function somewhat defies the purpose of having a portable charger. The Magic Cable Duo is priced at $24.99 while the Magic Cable Trio cost $19.99. Both come with either a 15W dual USB adapter sold for $39.99 or a 10W car charger for $34.99. Buy both for $49.99. The Magic Cables has a three-year limited warranty, so don’t forget to register it online when you buy one. Do the Innergie Magic Cables sound magical to you? Don’t forget to post a comment here! This entry was posted in Articles, Innergie, USB Charger, USB Devices, USB Gadgets, USB Technology and tagged Innergie, Innergie Magic Cable, Innergie Magic Cable Trio USB, Innergie Magic Cable USB Duo Trio, Innergie Magic USB Cable Duo, Innergie Magic USB cables, Magic Cables, Magic USB Cable, Single Cable for All Your USB Devices, USB connector. Bookmark the permalink. Great line of USB cable products. I hope you can post more of your great products here. Nice blog.